I was telephoned a couple of weeks ago by professional angler Leon, who,during a fishing trip on the west side of Shetland, had come across otters behaving rather oddly. It was his opinion that the otter population had boomed, and so these secretive and shy creatures were much more in evidence than normal. But to see one brazenly carrying a dead rabbit back to the sea was, to say the least, unusual. We see otters quite regularly - we live on the shore and a gigantic dog otter is frequently to be spotted patrolling the sea wall. 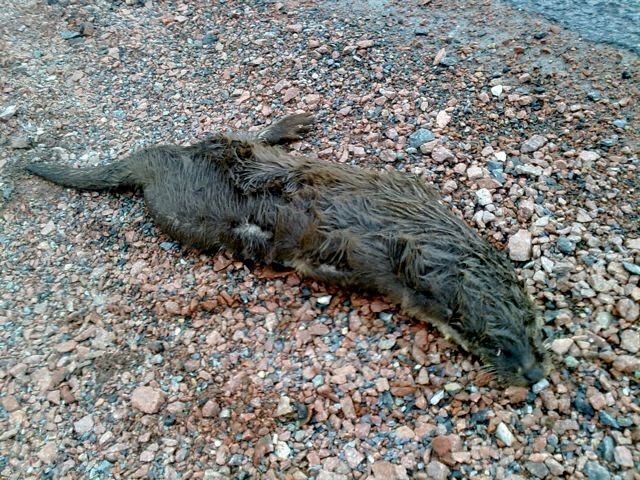 I have never seen an otter at the Mavis Grind - site of the famous 'beware otters crossing' sign. But occasionally, you will glimpse one by the side of the road, or dashing in front of the car. Bizarrely, I was showing Radio Two DJ Mark Radcliffe the cliffs at Eshaness when bold as brass, one popped up behind the lighthouse to have a look at us. Today, taking Magnus to the airport, I came across a freshly-killed otter at the top of the Clavie, the hill climbing past Urafirth out of Hillswick. 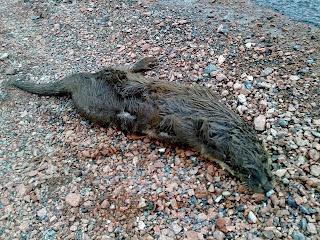 Then, on the way back, north of Orbister in Northmavine, another big otter ran (safely)in front of the car on the way from sea to loch. Most unusual. We had an inquiry this week from a prospective renter of our holiday cottage in Heylor, and, in the week that Simon King's book about his sojourn in Shetland comes out, they were excitedly asking about wildlife. 'Any otters?' Yes. A lot. Just be careful you don't have a closer encounter with one than you may have wished. Hey (Hey!) You (You!) I wanna be your...lawyer! In my business, and at my advanced age, shiny, squeaky new pop music inevitably pushes the memory button all too often. Laura Marling's Devil's Spoke is a great wee record, but the verses are Bob dylan's It's Alright Ma, I'm Only Bleeding, somewhat folkified. The new American playlist darling Lissie Maurus sounds so much like Rumours-period Fleetwood Mac it's embarrassing. Newton Faulkener's Del Amitri and Peter Gabriel influences are written gauchely large and as for The View's shameless appropriation of Cornershop...don't start. As it happens, I was perusing Lindsay Hutton's excellent Next Big Thing site the other day and came across this live video of the wilfully and wonderfully eccentric Rubinoos' 1979 hit I Wanna Be Your Boyfriend (they're still going weird: now children's entertainers, a kind of Singing Kettle with Fender Stratocasters). Then, I was listening to SIBC in the car and Avril Lavigne's single (originally 2007, but now getting heavy rotation) Girlfriend popped up. My Sweet Lord, I thought! The lawsuit was settled out of court, it seems. (Thanks to Anon. for that info - see comment below) Judge for yourselves! Joe West is little known in this country - but he's in the fine tradition of eccentric, intellectual art-Americana, as pioneered by the likes of Terry Allen. James and I toured with him four years ago and had a fine time, though that was the trip during which James dropped his double bass down a Glasgow tenement stairwell, to disastrous effect. Anyway, this charming video and lovely wee song is from his latest album. Enjoy! It's four years old...a fabulous wee video that was shamelessly ripped off for a pet food advert. Here we sit, 180-odd miles from Aberdeen, 180-odd miles from Bergen, preparing for our abandonment by Greater Scotland. That’s what it feels like. Stewart Stevenson, transport minister at the Holyrood Parliament, has announced that, to save money, the part-CaleyGov owned NorthLink Ferries will, from May and without any consultation at all, run its boats on two engines, not four. Because the boats run on schedules calculated to save cash anyway, and to arrive in port without incurring dockers’ overtime, this will mean ‘only’ an hour’s extra voyaging. The trip from Lerwick to Aberdeen will last 13 hours, not 12. But the killer is the twice-a-week Lerwick-Orkney-Aberdeen run, which will now have to leave at 4.00pm. With an hour’s check-in for vehicles, that means that most working stiffs won’t be able to make the deadline. In addition, and betraying the complete lack of intelligence involved in this decision, a perceived ‘passenger over capacity’ in the winter could lead to cancellation of some sailings altogether. Why is this abandonment? Why is this daft? Why does this exhibit either indifference or utter ignorance? Because these ferries are not just ‘passenger’ carriers. They are lifeline connections loaded with freight, exports, imports, essential supplies. Food, for example. Fish. It’s also, on a wider scale, economically brainless . Shetland is facing up to a five-year-period in which it is poised to become even more of Scotland’s energy powerhouse – wind, tidal, gas as well as oil. There are massive construction projects in the offing which could employ hundreds of people, and every square foot of freight transport capacity is going to be needed. It might be possible to view this as a Nationalist administration’s contempt for a community which is dyed-in the-wool Libocrat. But the potential loss to Scotland’s overall economy is massive. It’s hard to see this decision as anything but the utmost stupidity. Think again, Mr Stevenson. On the whole, we prefer to be Scottish. For the moment. Thanks to Lord Jo Grimond, I was once in a car with no floor, trundling unevenly around the single track roads of Yell, the unsilenced exhaust roaring. The late Orkney and Shetland MP accomplished many things, but for generations of drivers in the outer islands of Scotland, his amendment to the Road Traffic Act remains a Triumph. Or a Citroen. And very often a Toyota. For as long as you are on an island which does not possess an official testing station, you do not require an MOT (standing for the now- redundant in all other circumstances term ‘Ministry of Transport’; these days it’s Department FOR Transport). You do need road tax, and your car must be, ahem ‘roadworthy’. That term, as I discovered during frequent visits to Shetland islands like Yell and Unst, is somewhat flexible. I mean, who really needs a floor? And don’t tyres work better when completely smooth? This has given rise, in the Greater Zetlandics, to the phenomenon of the ‘isles car’. A vehicle reaching the end of its working life in an environment where such things as emissions are checked for pungency, where brakes have to work without showers of sparks appearing from the wheels. Shetland’s main island, imaginatively called Mainland, has MOT testing stations. But Yell, Unst, Bressay and Whalsay, all equipped with functioning, if sheep-ravaged roads, do not, and thus welcome the diseased-but-mobile among motors. Extremely popular in the Zetlandics as a mode of transport is the pick-up truck, with or without Ifor Williams, Brahma or Truckman rear canopy. It’s ideal for the crofter with dogs, grandmothers or hay bales to transport, and as most have four wheel drive, it can cope with the roughest of tracks and the most virulent of weather. For years, you were no-one without a Toyota Hi-Lux, the reliability of which has now been mythologised by Clarkson and Co on Top Gear. Of late, though, young upstarts from Nissan, Mitsubishi, Mazda and even Ford have made an appearance. Land Rover Defenders still abound among traditionalists, though they lack the comfort and, i can testify from personal experience, such modern safety features such as airbags, or the ability to remain stable when going round corners in slippy conditions. Or, for that matter, in straight lines. The “Double Cab” pick-up means that a working vehicle can be used as a family car as well as a miniature lorry, and there are murky areas of VAT, income tax and insurance where it also provides advantages. I wouldn’t know anything about that. All I can say is that my X-reg Isuzu twin-cab, Brahma-topped 2.8 turbo diesel pickup saved our bacon, our peats supply, access to offspring’s music lessons and my employment, time and time again over the winter. Solid, battered but apparently sound, I was proud of its rattling, roaring capacity to tackle the deepest snow without flinching. Even if it did smell of roofing bitumen and fish. I took the rumbling old beast down to Shetland’s informal car sales lot, the car park at North Lochside in Lerwick, and put a notice in the windscreen: “MOT and Tax April. Great runner. Needs welding. Spares, repair or isles. £400” Within 40 minutes of parking it, it had been sold. For isles use? No, to a man with his own welding torch, and the perennial Zetlandic need to tow a boat. I told him what Peter had said. In a small island community, you don’t want any comebacks, especially when it comes to a potentially collapsing chassis. But all was fine. We both knew that, if all else failed, a second life awaited in the outer isles. He handed over the £400 in cash, we signed off the documentation. And it was only then I remembered about this thing called a ‘scrappage scheme’. What the hell was that all about?